SQ series (ScanaQuad) logic analyzer let capture, analyze and generate logic signals on 4 channels, at sampling rates up to 200MHz. They connect via USB to a computer running our free ScanaStudio software to display, decode and analyze captured signals. Being 4 channels makes it a low budget device, while still covering all serial protocols analysis and debugging needs. That includes (but not limited to): SPI, I2C, USART, 1-Wire, CAN, LIN, I2C, RS232, RS485, TWI and much more (click for full list of supported protocol decoders). 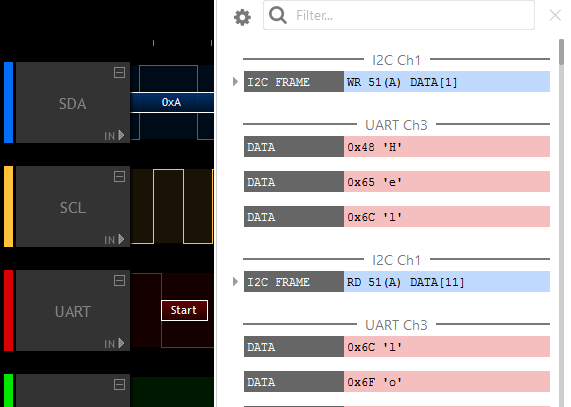 ScanaQuad is also able to generate captured signals (play back), or build genuine arbitrary test patterns, like UART, SPI or I2C packets. It can also be used to compose and generate Frequency modulation (FM) signals and pulse width modulation (PWM) signals. Thanks to the mixed mode, SQ devices can even capture and generate digital signals simultaneously. Mixed mode is specifically designed to allow engineers to stimulate a circuit with test signals and capture its response. SQ series is composed of 4 different versions: SQ25, SQ50, SQ100 and SQ200. All versions have 4 channels. They cover sampling rates from 25MHz up to 200MHz, and sampling depths of 256K points / channel up to 4M points / channel. The table below summarizes the main differences between the 4 models. 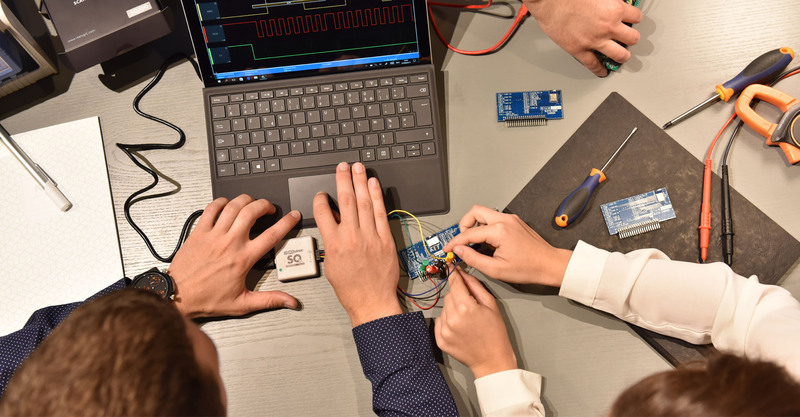 By combining logic analyzer and pattern generator capabilities in a single low price device, SQ is a perfect solution for students and small design houses. For more channels and more performances, check SP series logic analyzers. Get quick insight into your serial communication application. Software running on Windows, macOS and Linux. Software is intuitive and very easy to use. Generate test patterns to stimulate a system without any other equipment. 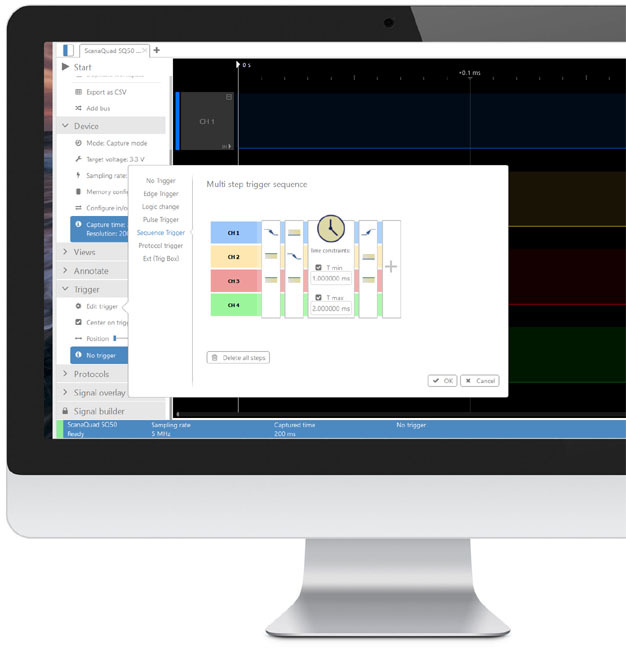 ScanaStudio application packs all the features you need to capture, measure and analyze analog signals. It's available free of charge for the major platforms below. The application is regularly updated, please check the release notes here. Drivers are included in ScanaStudio's windows installer. That being said, windows based machines may need devices drivers to be (re)installed separately. For that reason, windows drivers is available below. Purchase can be made directly via our online store. Please select the desired model from the list below. Alternatively, you can select one of our authorized distributors from this list. Ikalogic is dedicated to offering you the best user experience, specially after your purchase. All products have a 3 years warranty, and if you experience any problem during this period, repair or replacement is free of charge. After the warranty period or if for any reason you have lost some accessories and need replacement ones, you may get all the services you need from this page. For any other inquiries, please contact us.